Dr. Weeks’ Comment: What genius to ask the magical honeybee to bring her amazing light metabolism to bear on the creation of a potentized all-heal new honey. This is apitherapy at the cosmic level! 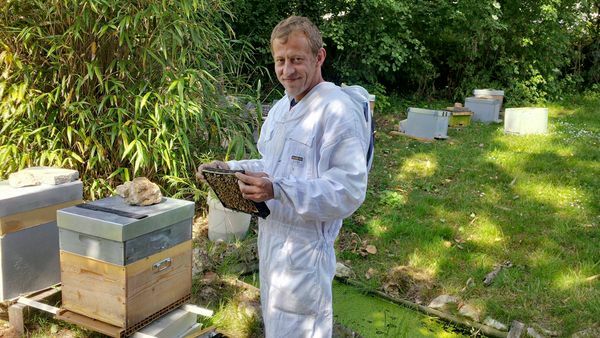 The French beekeeper has self-medicated with cannabis since a very early age and he defines himself as someone that is passionate about nature and training all kinds of animals. Both of these factors have led him to spend years researching how to combine the properties of the plant and the insects that he dedicated his life to. 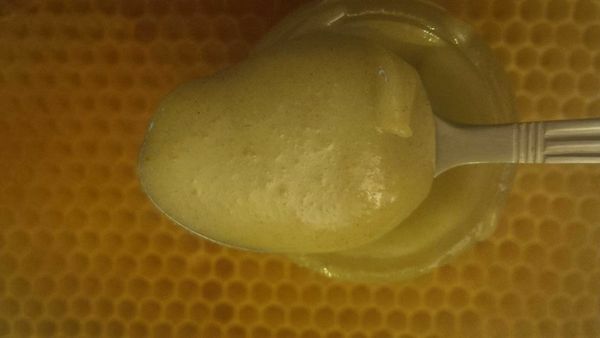 The result is “cannahoney”, a delicious nectar that has not gone unnoticed by anyone and that has to confront the restrictive laws of his country. “I have trained bees to do several things, such as collect sugar from fruits, instead of using flowers”. In addition to beers, he has also worked with tarantulas, lizards and ants because, as he explains, he has “been passionate about nature since childhood”. This has led him to learn about the world of animal biology, entomology, cannabis growing, improving all kinds of plants and everything related to the world of beehives. For a while now he has been working with bees that produce “cannahoney”, the name he decided to give to his peculiar cannabis honey. However, he modestly says that he has not created honey, “but rather a training technique whereby the bees collect the resin and use it in the beehive”. Afterwards, the final substance is the sole work of the little insects. 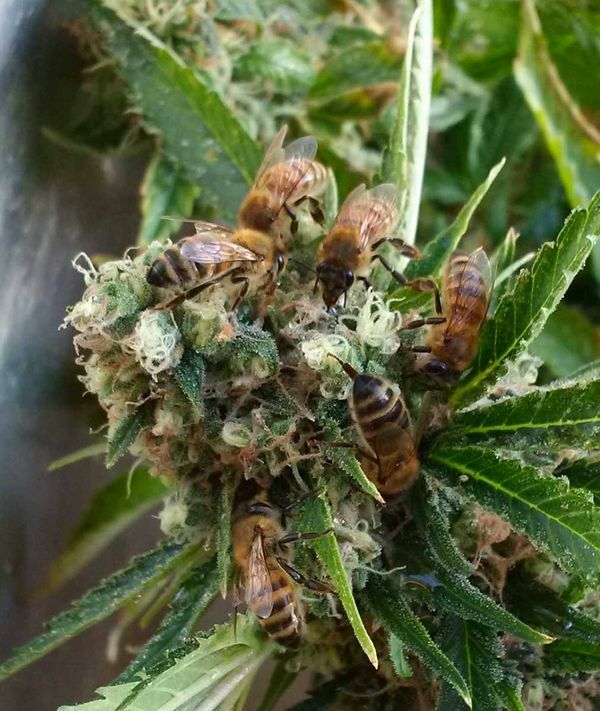 How did a beekeeper decide that his bees should obtain nectar from cannabis? Firstly, due to personal experience. Nicolas has been hyperactive since the age of 7, and that along with an educational system that labelled him as “unsuitable”, soon led him to leave school. At a young age he discovered that the plant helped him to channel the problem and, therefore, “I began consuming before the age of 10”, he states. 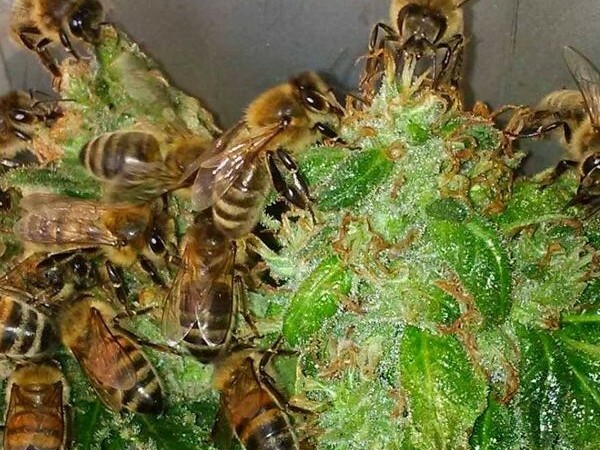 Years later, many people that know about his abilities raising and training bees began to ask him why he would not start applying them to the world of cannabis, and get the insects to create a kind of honey with the cannabis plants. He had realised that, by uniting the properties of both things, and if the animals managed to use the resin correctly, he would obtain a great result: “For some time I had known about the health benefits of bee products such as honey, propolis, pollen, wax and royal jelly and also about the benefits of cannabis”, and so he decided to take notice of the requests. Also, “everything that passes through the body of a bee is improved”, he says, given that their enzymes make the nectar turn into the desired honey. The resin obtained from willows, poplars and other trees is turned into propolis, which is an antiseptic, antibiotic, antifungal, antibacterial and also has healing properties. 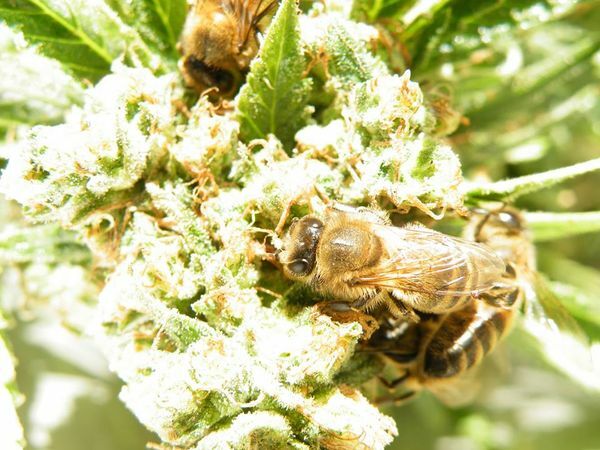 “So if the bee took the resin from cannabis it would also be very beneficial”. “The aim arose for me to get the bees to obtain this resin”, he comments. From that moment onwards (back in 2006) he spent time observing them, examining the hives and the behaviour of their members and thinking that there had to be a way of attracting a good group of insects to the resin. “That was the starting point for my investigation”, he explains. When he began his inquiries he found that up until then nobody had brought together both worlds, and the most sceptical people even told him that cannabis was not a typical plant for obtaining honey, therefore it would be impossible to get the bees to go by themselves to collect its particular pollen. Nicolas has shown the most simple-minded people that they were wrong. Following several tests and lots of observation he managed to get results from his training in 2013, “with the enormous surprise that the bees used the resin as propolis” and also to create honey with the same effects as cannabis. Its terpenes have “a delicious and pleasant taste” that are reminiscent of the fresh plant, although its taste changes slightly from one crop to another. “Cannahoney” normally has “quite a floral” aroma and a colour that slightly changes depending on the varieties, although it usually ranges from light green to white or yellow. The substance “is not smoked, it is ingested and it is good for health”, explains the creator. Nicolas uses varieties of cannabis that he has created. He says that, “the bees accept any strain”, therefore he also uses already existing types. In fact, the last batch of honey was created using Californian Orange. Before he obtained his first results, some people dared to say that cannabis was harmful for bees. He was totally convinced that was not the case, but he had to wait two years until the project was well consolidated and he was able to demonstrate that the plants had no negative impact on the insects. 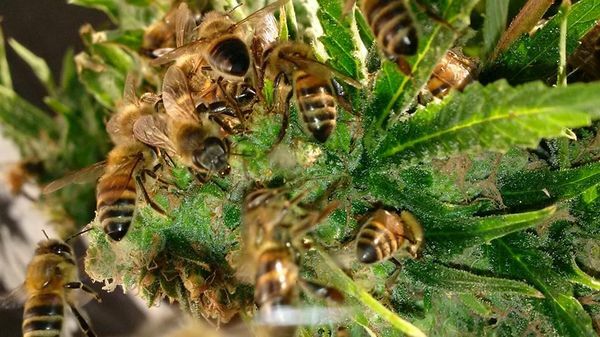 “The bees that produce the cannahoney are not affected by cannabinoids because they do not have an endocannabinoid system”, he explains. He now has 30 beehives, and he uses many of them for his cannabis honey project. However, he faces difficulties living in a country that puts up a lot of barriers in relation to all cannabis matters, therefore he is forced to grow his plants in open air spaces, far from his home. In this situation he takes a lot of risks, especially trying to transport his plants close to the hives during the necessary time so that the bees can take advantage of their new “pollen”. His situation does not prevent him interacting with his followers over social networks, where he normally publishes lots of research studies that back the medical properties of cannabis that he himself experiments with. The photographs that he publishes speak for themselves; in them it is possible to see not only the plants accompanied by the bees, but also, for example, crepes created by him and served with his honey. Nicolas dedicates almost all of his time to this profession; therefore he has no website or blogs: “I work alone with my wife and I do not have time or money to do much else”. Such attractive photos ensure that many users ask him endlessly when they will be able to get hold of the substance, although he admits that he still requires a more detailed analysis in order to determine all of its properties. Despite this, he states that three people with anxiety tried a few spoonfuls “and felt a lot better”.